My first computers were the Texas Instruments 99/4 and /4A. I bought mine as an adult friend was an engineer at TI and my first computer mentor who also offered me the employee discount. Sadly, though the first 16-bit home computers, these were probably the most proprietary, shackled, and closed home computers in the universe. I wrote many an Extended Basic program with them, but I longed for a bit more open of a box to play with. I was an early reader of Byte and Computer Shopper magazines (back when they were far more interesting in the early 1980s. I always had a hankering for CP/M computers, but those were sadly far beyond my means as a teenager. 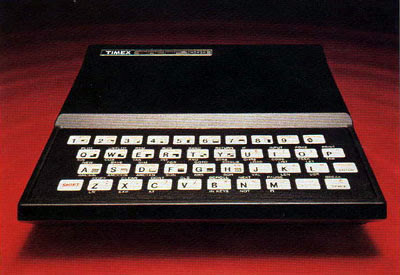 When I saw some of the amazing things being done with the Timex/Sinclair 1000, always considered a "toy" computer, I was intrigued. These were so stunning simple and cheap that even a kid like me could acquire one and, more importantly, it was so simple that expansion was wide open. The most amazing things were done with this hardware, things far, far beyond its original design. I didn't write as many programs for the T/S1000 as I did for the TI home computers, but I had endless fun souping the thing up and making modifications. Years later, I haven't touched my TIs, but I still pull out my Timex occasionally and made another change to it. I increased its memory to 32k (I know, that seems pathetic these days) and wired up a better keyboard (strangely, old TI keyboards are just about perfect). I will have to post a picture of the rat's nest that the computer has become, which I think is kinda cool and looks the way a home-made computer is supposed to - wires, free-floating chips, discrete components and all.